During the winter debates, His Holiness the Gyalwang Karmapa made a special time to announce the creation of a new software program for a searchable version of the Jang Kangyur (the words of the Buddha). Adarsha means mirror and the program is so named because the scriptures appear on our computer screens just like a reflection in a mirror. The Karmapa noted that the twenty-first century is a time of technology which makes information easily available. We no longer have to travel to a library to access texts, but can download them directly from the Internet. Programs like Adarsha, which runs on a PC or a Mac, will make study and research much easier and help to preserve Tibet’s wisdom tradition as well as its culture. The Karmapa’s plan is to also make available different editions of the Kangyur and Tengyur (the commentarial treatises) as well as the collected works of the great Tibetan masters and scholars. Right now, this is a pilot project, a beta version, but in the future there will be no problem to obtain copies of it. A few minutes into his talk, the Karmapa lifted up an elegant, small silver box. He opened the lid and took out a USB in the shape of a golden key, which held seventy-one volumes of the Jang Kangyur; they contain its first 298 texts from the vinaya through to the sutra sections. For over two years, these texts have been checked and carefully edited by a team of twenty-one people. This work of inputting and meticulously checking the texts is difficult, the Karmapa noted, as it’s rather tedious and still requires very careful attention. The team had to sit at the computer all day long and often worked until their eyes hurt. They also trimmed and resized all the scans so that they all measured the same. 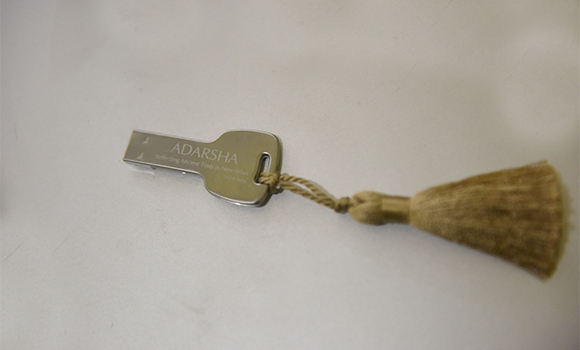 The software developer for Adarsha is from Taiwan, where Internet connections are excellent and it’s easy to connect to the whole world. The texts can be searched in both Tibetan letters or in Wylie transliteration as most western scholars use the latter. Another aide to research, which took effort and time, is a comparison of various editions of the Kangyur, such as the Jang, Dege, Beijing, and Cone. This was printed in two large books. The original text of the Jang Kangyur was the first wood block print in Tibet. It was sponsored by the King of Jang and edited by the Sixth Shamar Rinpoche Mipham Chokyi Wangchuk. When the Eighth Situ Chokyi Jungne was conducting his research for the famous Dege Kangyur, he relied mostly on this Jang Kangyur. Since these wood blocks were eventually kept in the Lithang Monastery, this redaction of the Kangyur is also known as the Lithang Kangyur. These blocks, however, were burnt so we do not have a complete edition and the prints are quite rare. 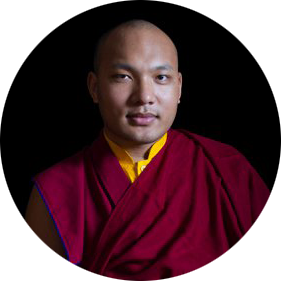 Continuing his discussion of the present project, the Karmapa mentioned that since there is always a possibility of error, the input texts are accompanied by scans of the original so they can be checked against an impartial record. For ease of search, the texts will be divided into chapters and then paragraphs, depending on their meaning. These would be given a number allowing a researcher to find a word or concept easily as the program would provide a specific reference. The Karmapa also has plans to incorporate a dictionary into the project as well as a listing of the old spellings and their new counterparts. The older version of how to spell a word is often found in the Vinaya, for example. In the future, Sanskrit and Chinese texts will be made available so that these can be compared with the Tibetan. It would be difficult to input all these texts, but the most important can be selected, such as The Heart Sutra, The Diamond Sutra, The Pratimoksha Sutra, and so forth. Also possible will be searching for a word in all three languages as well as English. Given the vastness of this task, the assistance of many scholars and skilled staff will be needed to complete it. The plan is to have the whole Jang Kangyur finished by 2016; the intention is to preserve and make easily available these treasures of the Buddhist tradition, thereby encouraging a delighted interest in research and study.